How do you create top-of-mind awareness while getting new leads? SD Worx found out that top-of-mind awareness with clients and prospects was slipping. They wanted to position themselves as a proactive HR service company that does so much more than payroll administration. There were two goals. One: increase brand consideration with clients and prospects. Two: create fresh leads for their payroll administration and develop a new product for large companies: flex income plan. We approached the target group - HR managers - with a classic campaign called “If only I had known.” We communicated HR situations they can relate to, and more importantly, they want to avoid. Through radio, print ads, social media such as Twitter, Facebook and LinkedIn. At the same time, we set up a huge blog. This huge Hubspot blog contained a lot of advice and tricks: 50 articles, infographics, tests, white papers on different topics for every target group. 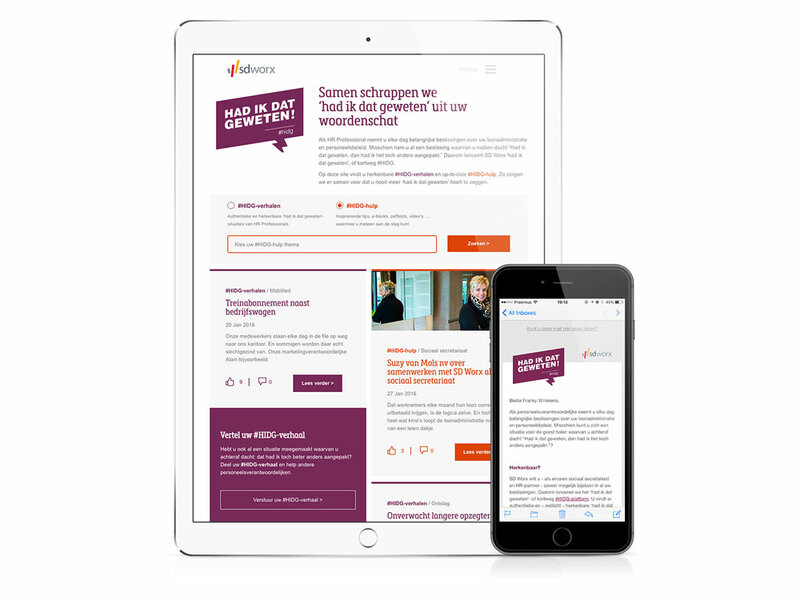 It really showed that SD Worx can meet the different HR challenges of the different target groups: HR managers for small and large companies. Got a lead? Make them sales ready. Through a score model we mapped the click behaviour of the blog visitors. Then, we send an e-mail to identified leads that was tailored to their behaviour and profile. Until they were as sales ready. 10% of visitors were identified as leads. 10% of identified visitors were converted as sales ready leads through follow-up communication. SD Worx’s top of mind awareness increased from 45% to 71%. Brand consideration amongst prospects increased from 5% to 36%.